Just six months after Dropbox acquired the photo-sharing service, Snapjoy has announced that it will be shutting down on July 24. 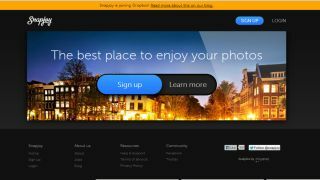 Snapjoy provided users online storage for their photos, as well as the ability to organise and pull in photos from their other online photo libraries, such as Flickr and Picasa, into one central place. Users could share their albums and photos, or keep it private. "After two years of building Snapjoy, the time has come for us to shut down the service. It's been a journey unlike anything we'd imagined, and we can't thank you enough for your support and input along the way," the company wrote on its blog and in an email sent to users. Users will be able to export their photo albums until July 24, when the service shuts down completely. The company said that all files will be permanently deleted afterwards. Cloud storage service Dropbox acquired Snapjoy in December 2013. Although Snapjoy had stopped taking on new signups from that point, users were still able to use the service. At the time of acquisition, Snapjoy had written on its blog: "By combining forces with their amazing team, we can leverage the technology and scale of their platform and focus on what matters - delivering an incredible photo experience to over 100 million people." With the announcement over the weekend, it is yet unclear how this will impact Dropbox services or what Dropbox has planned. Just before the Snapjoy acquisition, however, Dropbox had begun rolling out a photo tab in its mobile apps, which indicates that it may be moving to offer new photo storage services within the Dropbox interface.